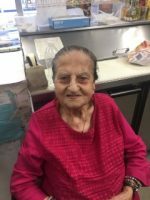 Mountaha Handy, 92, of Colchester, Vermont passed away peacefully after a short illness, surrounded by her loving family on January 15, 2019. She was born in Ghadir, Lebanon on December 16, 1926, the daughter of Mikael and Estier Audi. In Arabic, her name means “ the highest level of sweetness”. Mountaha came from a poor family and she began working at the age of 13 in the tobacco fields for the Maronite Archbishop of Jounieh, Lebanon where she met her future husband, Salamin Handy, and developed a long friendship with him. Eventually, he realized that Mountaha was the woman whom he wanted to marry. They were married in 1951 in Lebanon where they began to raise a family. During the early 1960’s, Mountaha helped her husband to run a small gasoline trucking company in Lebanon. The business eventually grew into a Mobil Oil distributorship for aviation fuel. In 1967, war erupted in their native Lebanon which forced Salamin to sell his business. He then emigrated to the United States in 1968. 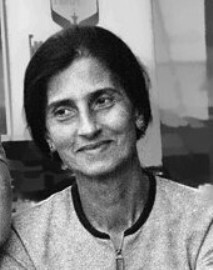 Mountaha followed with her six children in 1969, after her husband had earned the means for his family to join him. She was immensely proud of becoming a U.S. citizen along with her family and she loved the state of Vermont and its people, often stating that she would not live anywhere else. Together, Salamin and Mountaha established Handy’s Texaco on South Winooski Avenue and subsequently opened a chain of convenience stores known as” Simon’s ". Although she came from humble beginnings, Mountaha contributed to her husband's success in his business from what she had learned in her life. Mountaha was a devoted wife, mother, and grandmother, cooking lunch and dinner daily for her family and even bringing food into their workplaces. She often hosted large cookouts at the family’s summer camp, cooking delicious Lebanese food. Mountaha was a simple woman with traditional values who loved to cook for an ever-increasing family as her children married and brought her grandchildren. After Mountaha’s husband passed away in 1997, she become the silent backbone of the family, inspiring her children and grandchildren to continue to grow the businesses that she and her husband had founded. In her 80’s, Mountaha traveled to Lebanon and Australia twice, to visit members of her family who had either remained in her home country or emigrated abroad. She also visited Ireland, Sweden and many regions within the United States. When she first came here, Mountaha learned much about American culture by watching popular television programs which she enjoyed, like The Jackie Gleason Show. She self taught herself English. She was a woman who was full of life and vitality; she loved to laugh and to get to know people. Until 2 months ago, Mountaha could be seen at work every night from 11:00 pm until 6:00 am, greeting and chatting with her customers. She was known for taking the time to listen to people, give advice or to offer help to customers whose appreciation earned her their affection; they called her Ma or Grandma. Mountaha is survived by her six children: Gabe, Charlie, Joseph, Joan, Tony, Laura, and their spouses. She is also survived by many grandchildren: Darcy, Sean, Courtney, Jordan, Samira, Mathew, Kristen, Joey, Amira, Simon, Christopher. She also leaves several great grandchildren. Mountaha was predeceased by her husband of 46 years; a daughter Rita who died at childbirth; two daughters-in-law, Jennifer and Diana; as well as three brothers, Hannah, Tonnias, and Habib. One younger brother and sister died in Lebanon during a period of famine. Mountaha also leaves behind many nieces and nephews in Vermont, Canada, Australia, and Lebanon. A special thanks to Lisa Lau who is like a daughter to her. Mountaha will be deeply missed by her family and many friends in the Burlington community. Visitation hours were at Boucher & Pritchard Funeral Home at 85 North Winooski Avenue in Burlington on Sunday, January 20th from 4:00-8:00 pm. A Mass of Christian Burial was celebrated at St. Francis Xavier Church in Winooski, Vermont on Monday morning January 21st at 11:00 am.. Interment followed immediately after the Mass in Resurrection Park Cemetery. Donations to St. Jude Children’s Hospital may be made in Mountaha Handy’s memory. The address for donations is 262 Thomas Place, Memphis, TN 38105.